Bainton is the well-known author of Here I Stand,” the biography of Martin Luther. This is a 1956 “Anvil Original” by Nostrand Company. 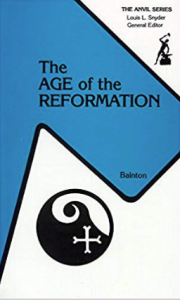 This series is in paperback and very readable in each volume (the is the second I’ve read by Bainton). Though about 200 pages, the book is arranged with the first 100 pages containing eight sections, and the last 100 pages containing original “readings” from various persons in history. The subject is usually divided into Catholic, Protestant, and Anabaptist points of view which include not only the Protestant Reformation with Luther, Calvin, and Zwingli, but also the Catholic counter-Reformation. Anabaptism is not given the prominent place I might like, but is treated fairly although it is too often characterized by Thomas Müntzer alone. The Reformation sections include the English and Scottish Reformations as well.